Let’s talk about nouns and quantifiers. 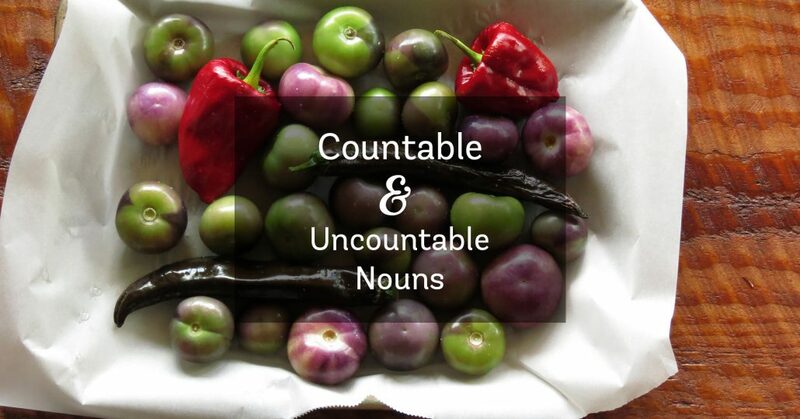 A noun can be countable or uncountable. Countable nouns are those that refer to something that can be counted. They have both singular and plural forms. In the singular, they can be preceded by a or an. Most nouns are countable. Uncountable nouns have only one form do not have a plural form. For example: rain, wine, or sand. You cannot use a or an with uncountable nouns. I eat a banana every day. Rice is an uncountable noun.We cannot use numbers with uncountable nouns. So we cannot say “one rice,” “two rices,” etc. Kate was singing a song. There’s a nice beach near here. Do you have a $10 bill? Kate was listening to (some) music. There’s sand in my shoes. It wasn’t your fault. It was bad luck. I don’t like coffee very much. uncountable, because it’s referring to the drink in general. He ordered a coffee. countable, because it’s referring to a cup of coffee. There’s no truth in the rumours. uncountable, because it refers to the quality or state of being true. The fundamental truths about human nature countable, because it’s referring to facts or beliefs that are true. Different quantifiers are needed for countable and uncountable nouns. Sometimes the noun can be omitted when it is understood from the context. We use many and few with plural countable nouns. We use much and little with uncountable nouns. We didn’t take many pictures. We didn’t do much shopping. I have a few things to do. I have a little work to do. a few means some or a small number. few means not many or almost none. a little means some or a small amount. little means not much or almost nothing. Another, more common, way of saying less is not as much and another, more common, way of saying fewer is not as many. Similarly little would translate as not much and few would translate as not many. A. Complete the sentences using the following words. Sometimes the word needs to be plural (-s), and sometimes you need to use a/an. I had my camera, but I didn’t take any pictures. There are seven _________ in a week. A vegetarian is a person who doesn’t eat _________. Outside the movie theatre, there was _________ of people waiting to see the movie. I’m not very good at writing _________. Last night I went out with some _________ of mine. There were very few _________ in town today. The streets were almost empty. I’m going out for a walk. I need some fresh _________. Gary always wants things quickly. He doesn’t have much _________. I think it’s going to rain. Do you have _________ I could borrow? Do you speak any foreign _________? Our apartment is very small. We don’t have much _________. We have to hurry. We have _________ time. Listen carefully. I’m going to give you _________ advice. Do you mind if I ask you _________ questions? I don’t think Jill would be a good teacher. She has _________ patience. He isn’t very popular. He has very _________ friends. Ann is very busy these days. She has very _________ free time. Did you take _________ pictures while you were on vacation? I’m not very busy today. I don’t have _________ to do. The weather has been very dry recently. We’ve had very _________ rain. A vegetarian is a person who doesn’t eat meat. Outside the movie theatre, there was a line of people waiting to see the movie. I’m not very good at writing letters. Last night I went out with some friends of mine. There were very few people in town today. The streets were almost empty. I’m going out for a walk. I need some fresh air. Gary always wants things quickly. He doesn’t have much patience. I think it’s going to rain. Do you have an umbrella I could borrow? Our apartment is very small. We don’t have much space. We have to hurry. We have little time. Listen carefully. I’m going to give you a little advice. I don’t think Jill would be a good teacher. She has little patience. He isn’t very popular. He has very few friends. Ann is very busy these days. She has very little free time. Did you take many pictures while you were on vacation? I’m not very busy today. I don’t have much to do. The weather has been very dry recently. We’ve had very little rain. Murphy, R. Grammar in Use Intermediate. 3rd edition.